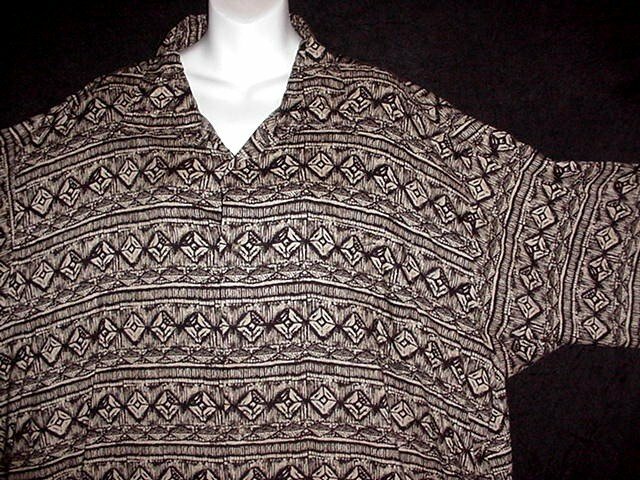 HAWAIIAN SHIRT Classic ALOHA Tapa -= TRIBAL =- Style Print BLACK and TAN Men's Size 3XL! Shirt: Shoulder seam to Shoulder seam across the top 20 1/2 inches, Underarm to Underarm/Chest 50 inches around, Waist 50 inches around and Overall Length is 34 inches from the top center back neckline to the hemline! **Condition** In Excellent, previously owned condition, the top neckline button at the collar is missing (can be easily replaced if desired) and other than that no visible flaws to report! Be sure to take a peek in the rest of the store for more big mens clothing, vintage Hawaiian Shirts, Gunne Sax Gowns, Angora, Mohair, Leather and Fur Boots, Designer Leather, Leopard and Lace! FLUFFY MOHAIR Vintage Sweater Cropped LIPSTICK RED Huge Gorgeous Buttons STUNNING and FESTIVE Sz L! Vintage CHAPS 1996 Long Sleeve Shirt RALPH LAUREN Deep Rich Colors 96 CRL 100% Cotton Men's L! 100% WOOL NEPAL Navy and Cream SOFT and THICK Ski Sweater! L ~ XL up to 42" Chest! GORGEOUS LACE Vintage Burgandy HIPPIE SKIRT w/CHIC SWEATER JACKET Tiered BOHO BABE SWEEP Sz M-L! SALE! Vintage Jacket Duster Cover Up BULLOCK'S WILSHIRE Made in FRANCE Blue Lace Soutache Sz S-M! HAWAIIAN SHIRT Classic PINEAPPLES FLORAL TAPA Tropical Print ALOHA Men's Size XXL/2X! SALE! Hippy Glam Dress ALLEN SCHWARTZ Maxi Gown FLOOR LENGTH Summer-Fall Day-Evening A.B.S. Sz XS-S!